Review of ZenSleep 5-in-1 Starter Kit: "Pretty Good"
ZenSleep offers a generous all-in-one kit, with multiple solutions to guarantee you find the perfect one for you. Not everyone snores for the same reason, but with their product, you’re bound to find what is best for you or your partner. , is actually quite simple - they provide 3 different high quality products that target the different types of snoring. 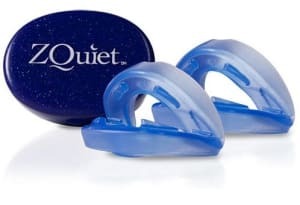 The ZenGuard is a tongue retaining device (mouthpiece), which opens up obstruction that causes the most common and annoying type of snoring - throat snoring (this is the reason mouthpieces are the most effective snoring solution). The second device is the ZenStrap - a premium jaw strap that supports the lower jaw in order to prevent snoring that originates from the mouth. The ZenVents open up your nasal passageways and thus stop snoring from the nose. In addition, you get 2 amazing bonuses - the ZenMask, and ZenPlugs - valued at $70. You really can't go wrong with this bundle of effective products at a compelling price. ZenSleep is a highly recommended product by Sleep Experts and Doctors across North America, and is a top selling solution for quite some time, enjoying terrific reviews and recommendations by customers as well. Featured across numerous prestige websites and FDA-approved, this is a safe bet for your buck. 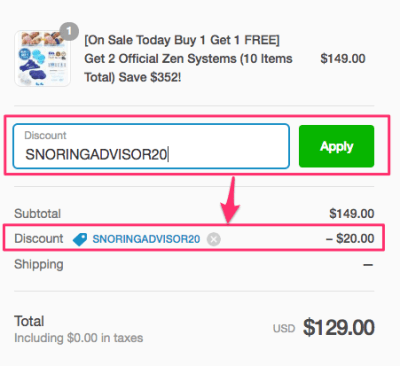 Use Coupon code SNORINGADVISOR20 at checkout for a 20% discount.